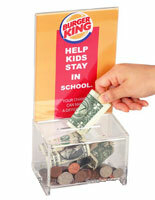 Are you shopping for a countertop money bin for your charity to place in a fast food restaurant or retail store? This small coin canister with cam-lock and key gives a secure appearance while allowing quicker and easier access for emptying collections from this fundraising canister. 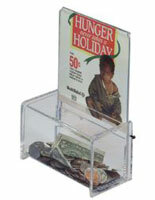 This countertop money bin also has a graphics display message area that acts as a sign holder or a literature holder. 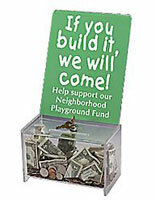 This small fundraising container is commonly seen at cash registers or high traffic areas. 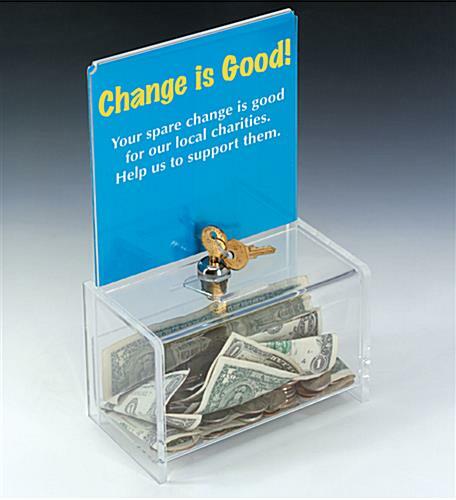 Charitable organizations use this countertop money to bin to increase their exposure and hopefully entice passersby to drop a few coins in the container. 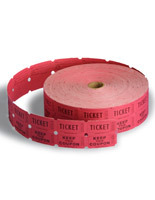 The small size doesn't get in the way of daily business transactions, yet is large enough to make an impact on patrons. 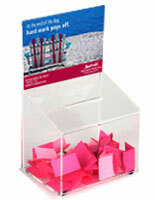 Use a countertop money bin that locks to collect funds for a seasonal event or a well-known charity. The durable acrylic design will withstand many years of use without needing to be replaced. 8.3" x 10.1" x 3.6"
I have ordered from other companies in the past and that will never happen again. These boxes are a much higher quality and have better locks and keys. 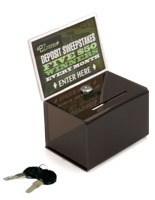 I ordered 5 of these and 5 larger boxes and all 10 use the same key which is a huge bonus. Everything was packaged very well and nothing was chipped or broken...something I can't say about other companies I've ordered from. This is the first year Vinyl Technology has offered a matching fundraiser campaign for The Breast Cancer Research Foundation. I printed some graphics, placed it in the face of the display and passed it around our plant. 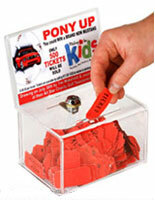 On the first day we filled it twice and collected $249. 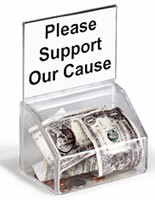 The company will match up to $1,000, doubling the donor's contribution. 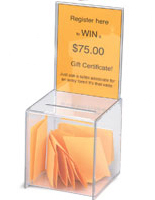 The acrylic donations box is made well, presents professionally and fun to see filled with money. People really got into it. I believe the box made a difference.